This trooper of Horse is one of 3 head variants with full equipment and blanket roll attached. There are 5 arm variants available 2 with pistol and 3 with sword. 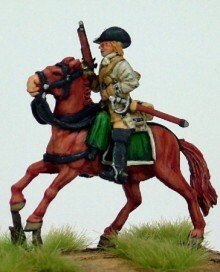 He is painted as a Danish trooper serving in Ireland. We are pleased to be able to offer six diffeent battlaion packs from our Swedish infantry range. Each battalion has 20 models from either 3 or 4 of our packs. As a special kick off incentive from today till the end of November 2015 we will provide two Swedish flags for the battalion of your choice free of charge.Just email wordtwister@hotmail.co.uk after you have placed your order.